No more estimating when your tank is empty, dipping sticks or relying on LCD plugs to tell you that you might be near to running out. 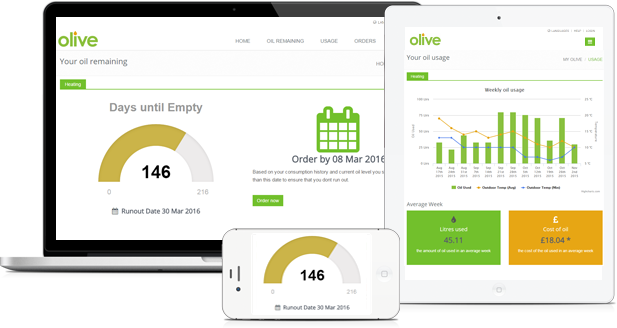 olive’s online portal will clearly show how much heating oil you have left in your tank, and a predicted run out date. With olive you'll automatic get email reminders when your oil level is getting low, this will ensure you don’t run out of oil again. olive delivers real peace-of-mind by letting you know in advance – whether on screen or by email of when you need to order some more oil. Automatic ordering with direct debit. We've been hard at work on making life easier. With our automatic ordering and direct debit payment service you really can forget about managing your heating oil. Our smart technology allows you to choose an automatic reorder when your tank reaches a set level. Once this is enabled leave it to us, we'll email you to confirm an order is being placed, the supplier will deliver your oil and payment will be collected via direct debit. All that and you didn't lift a finger. If your an existing customer and would like to enable this, click here if your not a customer, what are you waiting for ! we can even manage your oil ordering needs! See what our customers are saying..
"A well thought through product that allows for greater visibility of usage, excellent customer service from the team, feel like someone is interested in my needs." "Really easy to use, has really helped us monitor our oil usage and saved us money." "We are really enjoying using olive, quite amazing how much oil we are using each day and we are not even in wintertime just now!" "Wow - just saved over £40 on one order. Thanks!"